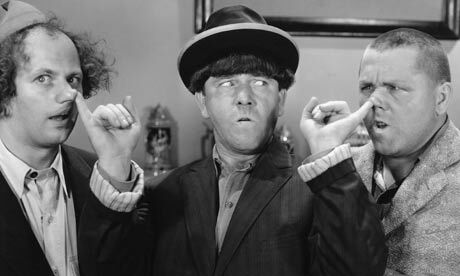 They are the perfect 2015 replacements for Larry, Moe and Curly. So diverse! Bristol Palin, a conservative woman; Geraldo Rivera,a Hispanic liberal who works for a conservative news network, and Dan Savage, a progressive gay scold! Too bad they aren’t funny. In fact, they are pathetic, and, of course, ethically inert. They also make “Porcupine” and the Howard Boys look classy by comparison, and they showered in their clothes. First, yecch, Bristol Palin. She is the epitome of a worthless celebrity. Arguably, she is worse that a Kardashian. Her claim to fame is embarrassing her mother by turning up pregnant and unmarried in the middle of the 2008 Presidential campaign. That’s it. That got her a slot on “Dancing With The Stars” and a reality show where she became the poster girl for unmarried motherhood as a clever career move. Then, mind-blowingly, she became a paid advocate for teenage abstinence before marriage, that is, unlike her. In 2011, Palin was paid more than a typical Hillary Clinton college speaking fee—over a quarter million dollars—to be the abstinence spokesperson for the Candies Foundation. Naturally, she got pregnant sans wedding ring again. No sympathy? Deal. But here’s the lecture: you owe the Candies Foundation—which, frankly, deserves this embarrassment for hiring a feckless reality star as a role model for impressionable teens–every cent you accepted as part of your con. But then your life is a con. You have no talent, no integrity, and no excuse for your conduct. Get an education, grow up, and go away. You degrade the culture and America’s values by your very existence. 1. Gratuitous Fox bashing. How is this story in any way connected to Fox? It isn’t; Palin’s mother doesn’t even work there anymore. Apparently it’s so offensive to autopilot progressives that there exists a news network that dares to tell the public about events that reflect poorly on the Obama administration that the plan is to blame Fox for everything, even things they haven’t done yet and are unlikely to. Last week, a South Carolina legislator blamed the Charleston shooting on Fox News, as a CNN hack nodded solemnly. Now Bristol Palin’s pregnancy mean that Fox is hypocritical, based on what they did in an alternate reality that Savage apparently can visit at will. 2. If an Obama teenaged daughter got pregnant, criticism would be valid and necessary. The event would be a cultural disaster for blacks, teens, and society. I hope Fox would criticize it. I hope every news organization would criticize it, not that they would. Savage represents responsible punditry as some kind of partisan smear, apparently believing that such conduct by the National Role Models would be just swell. 3. Savage, who fervently believes that anything involving anyone’s anything being inserted in anyone else’s anyplace should occur without shame or regrets, wants a news network to shame someone for something he doesn’t think is shame-worthy simply because he doesn’t like her mother. I happen to agree with his related point: Bristol Palin is a waste of life and blot on the cultural landscape, and Fox should slam her hypocrisy, and assist the effort to drive her off the national scene forever. Savage, however, is being a hypocrite while accusing Fox of hypocrisy. He sees nothing wrong with unmarried motherhood, but calls Fox hypocritical for not doing what he thinks would be wrong, while hypothetically doing what would be responsible. …thus invoking some of the memorable and inspiring rejoinders in the same vein uttered by Abe Lincoln to Stephen Douglas, by Franklin Roosevelt in the wake of Pearl Harbor, and by Thomas Paine, Patrick Henry and Thomas Jefferson to the tyranny of King George. ← Integrity Gut Check: Who Will Have The Courage To Oppose The Left’s Cultural Purge? I know it was meant as hyperbole but “… Bristol Palin is a waste of life …” is an awful thing to say (about anyone) and, frankly, it’s beneath you. Well, she has wasted her life so far in my view, and done no discernible good. Is she a waste of life? It depends on your definition of waste and life. A life, like a mind, is a terrible thing to waste. Until she shows herself capable of something other than having fatherless kids, exploiting her mother’s notoriety and accepting money for being famous for being famous, I’ll stick to “waste of life” as fair and justified. Sure it’s an awful thin g to say, and taking a $260,000 from a non-profit only to betray its mission is an awful thing to do. Single cell organisms don’t take money from anyone and demand “no lectures”—their lives, on balance, are more positive than Palin’s. 1. Anyone with a uterus can have a child…it’s mot a mark of virtue. 2. Goering had a sibling. Cain had a sibling. Serial killers have siblings. What a silly argument. 3. She virtually defrauded the foundation. She has never done anything of any values but have illegitimate kids and sponge off her mother. W-A-S-T-E.
4. She just made another statement that she intentionally got pregnant–with no husband, while being a spokesperson for an abstinence campaign for an obscene fee. Yes, Mary, she’s the salt of the Earth. 5. Trump and Bristol: are you starting a slimeball fan club or something? Who are you going to defend next? The Kardashians? Am I too mean to Bernie Madoff? Why don’t you defend John Edwards, he seems to fit your template for virtue. Al Sharpton, is he your style? Honey Boo Boo’s mom—want to tell me what’s great about her? Lance Armstrong? Michael Moore? Am I too hard on the Westboro Baptist Church? Here’s an idea: why don’t you concentrate on standing up for the many brave, honest and honorable people who are vilified for standing up for what’s right rather than rushing to rescue useless reality show hucksters from criticism they have earned? And start using upper case to start sentences with, please. This isn’t a graffiti wall, and you’re no e.e.cummings. Isn’t it strange that an elemental aspect of the human experience such as shame has become so verboten. Dumb. Of course all the creeps in Hollywood and their media enablers have taken the lead on this. They drop spouses and kids like dirty shirts, while we’re supposed to “celebrate” their next union du jour. Crazy. Savage’s reason for existing is now fulfilled. He needs to DIE, forthwith. How can any liberal go after Fox as not fair and balanced as long as they employ Geraldo. Blame them for being stupid, yes. Blame them for pandering to stupid liberals, yes. But, fair and balanced…YES as long as Alan Colmes and Geraldo work there they balance the stupid conservatives. because all the Left is oh so smart ! Have you had a stroke or something? Because your remarks used to actually have some substance, as well as using capital letters to start sentences. This kind of hit and run snark is not welcome here.